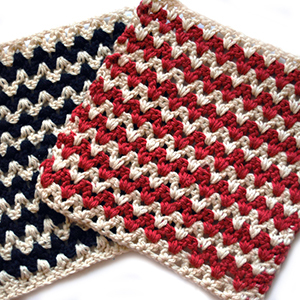 It’s time to set some weekly crochet goals! Every week, I make myself a list of what I’d like to accomplish. Sometimes I accomplish those things, and other times I don’t. I was wondering to myself how many other crafty folks are out there with their own list of goals, and then I thought about how lovely it would be if we could all share those goals – like a virtual crafting get-together. Wouldn’t it be fun to hold myself accountable and hear what everyone else has going on – I love to be inspired, and there are so many inspiring folks across the internet. So let’s try it, why not have a weekly check-in, where we share our projects and encourage each other along the way? If you have a blog post about what you’re working on, go ahead and link to it so we can all check it out (but that’s totally optional). Won’t you join in? Here are crochet goals for this week! First, I need to hustle a little on my County Fair afghan. I only have about 6 weeks and I have a lot of work yet to do on it. My goal for this week is to finish up the green leaves behind the flower and to add the yellow border. I also want all the ends woven in so far. Have I introduced my Bobble Blanket here yet? Oh, I have much to say about this one, which is quickly becoming one of my favorite projects to work on. I will definitely share what I’ve done so far this week, along with the free pattern link (it’s here, if you can’t wait!) It’s coming along pretty well. I aim to make and attach two bobble flowers a day, and that’s the goal for this week as well. 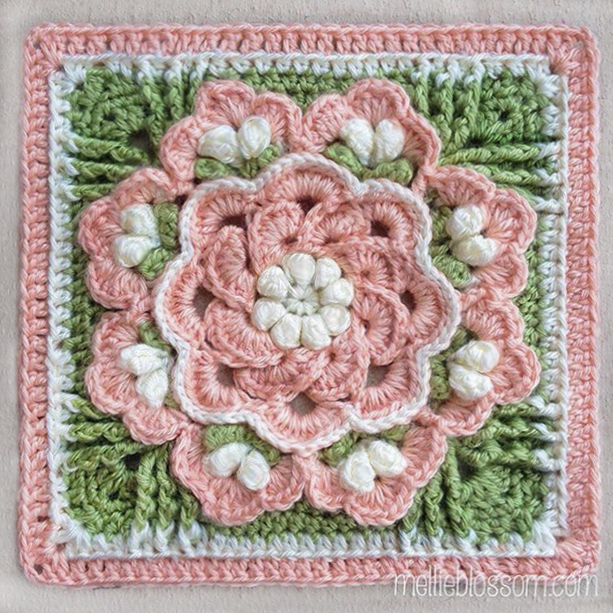 The Crochet-Sampler-Favorites newest square was chosen upon yesterday (join in this leisurely-paced, twice-a-month crochet-along if you’d like!) I’d like to finish this one up this week as well. The Flowers in the Snow crochet-along is also starting later this week on the Vanna’s Choice Fan Club board (but hasn’t started yet, so join in if you’d like!) I started making this project some time last year when it was selected as a stashbuster, but I stalled halfway and lost steam. My goal is to find this project somewhere tucked away in my yarn closet and to bring it out and assess what I’ve got going on; how many squares I still want to make and to set up an plan of how many I want done per week. So how about you? What will you be working on this week? Do tell in the comments! How fun! Ok, I am making up some granny squares for a blanket I’m making for my grandson. It isn’t anything fancy, but I’d like to try to get a couple dozen squares fine by the end of the week. Hey, neat idea. I have a crochet goal: I have a bunch of crochet squares that my mother started many years ago that have been sitting in my attic. I recently brought them down, and they’re in excellent condition. I’m hoping to go buy some yarn (it’s just a basic white acrylic yarn) and sew them all together. It’s not very big because I don’t think she was finished making the squares, but it will make a nice throw blanket for keeping my lap warm while I’m on the computer, and it’ll be a nice memory of her. So that’s my crochet goal for the week! Nice idea to do this, Mellie. What a sweet gift from mother to daughter! I don’t have any crochet goals right now, but I do have some knitting ones. I’m working on a few dishcloths for my best friend who’s moving into a new place this month. I want to knit her up some that would match her new kitchen. I am making a scarf. Can you upload photos here to share? I don’t have a blog. Hi Mellie! Your crafts are great! I’ve got a crochet blanket that my grandmother did when I was child! I know that there ia a great work to sewing them!